This beautiful purple butterfly stuffed animal is part of our imagination inspiring Sweet & Sassy collection and boasts vibrant royal purple wings accented in shiny magenta as well as rich yellow, lime green, and orange. This plush butterfly has amazing sparkly purple eyes in a smiling cream face and a cuddly body of soft lavender fur with shiny silver flecks and fluffy purple at the neck. 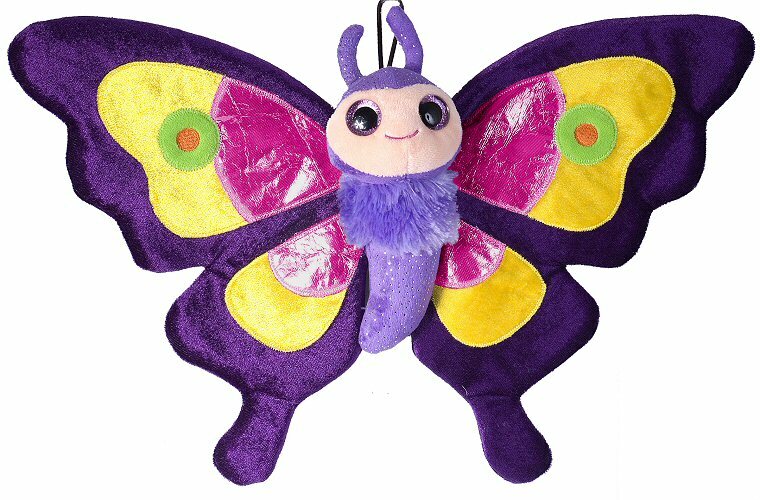 As an added bonus, a portion of the proceeds from the sale of this lovable Sweet & Sassy plush purple butterfly helps to provide housing and education for disadvantaged children, as well as protection for abandoned animals throughout the world. Fun Facts about Butterflies: Did you know that butterflies cannot fly in cold temperatures? Ideal flying temperatures for butterflies range from 85 to 100 degrees. If the air is colder than about 55 degrees, butterflies are rendered immobile.